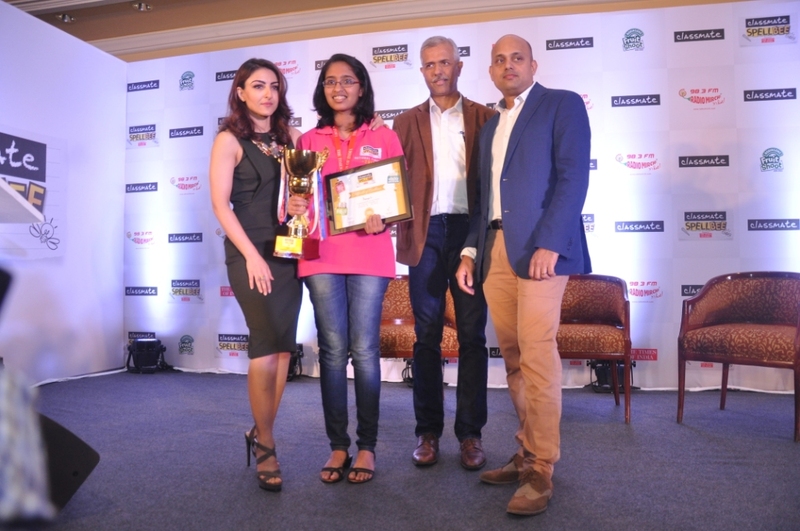 Mumbai, 8th March 2016: Classmate, one of India’s leading notebook brands by ITC and Radio Mirchi’s spelling extravaganza Classmate Spell Bee Season 8 culminated today with an exhilarating finish as Soha Ali Khan announced Ananya G Upadhya of Sri Kumaran Children’s Home CBSE (Mallasandra Campus), Bengaluru as the National Champion of India’s largest spelling competition. Samyukta Shrivatsa of PSBB Learning Leadership Academy, Bengaluru was the first runner up. The theme for the contest this year ‘Every child is unique and so is every word’ is inspired by Classmate’s brand thought of celebrating uniqueness. The competition this year was conducted across India and engaged with more than 3 lac students across 800 schools in 30 cities by testing their mettle in English spellings. The National Finals of Classmate Spell Bee Season 8 saw a grueling competition between the top 16 spellers of India in the search for the National Spell Bee Champion. The National Finals will be simulcast on The Discovery Channel, Discovery Kids and Discovery Tamil. Mr. Nripendranath Thakur, Head of Sales & Marketing, Education & Stationery Products Business (ESPB), ITC Ltd. said, "Classmate has always endeavored to recognize, nurture & celebrate the uniqueness of every child. Classmate Spell Bee Season 8 takes Classmate’s brand thought of celebrating uniqueness further as it gives students yet another opportunity to identify and showcase their distinctive talents and skills on a nationwide platform. Classmate Spell Bee season 8 builds on the scale we achieved last year with the aim of reaching out to an even larger number students across schools and cities in India, through a school contact program coupled with a novel mobile app and a dedicated website to engage students. The brand promises to support a child’s dreams with an equally unique & world class set of stationery products like notebooks, writing, drawing, art and math instruments." Mr. Abhishek Anand, Marketing Manager & Mr. Himavan Singh Dahiya, Brand Manager Classmate, comprising the Marketing Team at ITC’s ESPB have customized this multi layered student engagement platform to drive outreach and participation, to build on Classmate’s brand thought and take it to the next level. Unlike previous seasons, this year, the Spell Bee experience was extended through the entire year by creating learning modules, tests, interactive blogs and contests for students to remain connected to the art of spellings making it possible for them to qualify for the next season as well. The focus this year was to create a holistic educative experience for participants using a versatile mobile app and web based learning and practise solutions resident on the redesigned website enhancing the platforms salience with students. Classmate believes in encouraging children to excel in the field of their choice and Classmate Spell Bee season 8 has served to build this thought on ground, inspiring school students to identify and showcase their spelling skills through the competition. The National Champion of Classmate Spell Bee Season 8 will win a grand prize of Rs. 2,00,000/- apart from the opportunity to witness the prestigious Scripps National Spelling Bee 2016 with a parent in Washington D.C., U.S.A. in an all expenses paid trip. The 4 semi finalists will win a cash prize of Rs. 50,000 each. The grand prize for the winner of Classmate Spell Bee and those for the semi-finalists have been specifically designed and sponsored by Classmate to help encourage and enable students to follow their hearts true calling. The competition this year is powered by The Times of India, Robinson’s Fruit Shoot is the Fruit Drink Partner, Times NIE are Education Partners, Victor Tango are Event Partners and Discovery Kids is the Television Partner on the property. Classmate’s portfolio today comprises of offerings spanning across notebooks, writing instruments including pens and pencils, scholastic products such as geometry boxes, scales, erasers and sharpeners, as well as Art Stationery such as Wax Crayons, Color Pencils, Sketch pens and Oil Pastels. ITC is the manufacturer of India's first Ozone treated environment friendly Elemental Chlorine Free (ECF) pulp, paper and paperboard. It blends its knowledge of image processing, printing and conversion garnered from Packaging & Printing Business with its brand building and trade marketing & distribution strengths resident in its FMCG business to offer superior value products to consumers. Entertainment Network India Limited (ENIL), India’s leading private FM radio broadcaster, popularly known as Radio Mirchi, operates across 32 cities in the country. Launched in 2001, Radio Mirchi has the highest listenership across the country and a track record of developing innovative content, thus expanding and retaining its audiences and advertisers through the years. Radio Mirchi has delighted listeners and the industry with its exciting properties like the Purani Jeans Film Festival and the Mirchi Music Awards. Radio Mirchi’s continuous innovations across different platforms like Visual Radio or Mirchi Mobile have been instrumental in gaining leadership in the private FM Radio industry. Radio Mirchi made its international foray with the launch of the brand in the UAE. From 1st Feb, 2012, Radio Mirchi can be heard in Dubai, Abu Dhabi and Al Ain and is the first Indian radio brand to go international.